It was Sunday afternoon. The kids were driving me out of my mind and I really needed a break. I needed to get out! That’s when I got a text. My friend was inviting me to Pass the Paint, Pass the Wine at the Green Room Lounge in De Pere, and I jumped at the chance. I had no idea what I was actually in for…but here’s the story. My husband and I were both invited to go, like a date-night thing, with two other couples. We didn’t have time to find a babysitter, so he stayed home with the kids. Thanks babe, I’m out! Even though I went as the 5th wheel, I didn’t care one bit. I was just excited to get out of the house and be free to do something fun. When we got there, the hosts, who are also some of the guys who perform in the hilarious Comedy City Improv shows at the Green Room Lounge, shook our hands and introduced themselves right away. They were the ones who would be guiding us through the event. To start, everyone in the group got a blank canvas and an empty paint pallet. We also had a bottomless glass of wine and could visit the bar for another glass any time during the night! Before we started painting, the hosts gave us a few pointers. They told us we should paint the background first and as we passed our canvases and pallets, the next person would add details to the foreground, and so on. They also showed us some “not like this” examples from Pass the Paint events in the past. It was up to us to think of something to paint. It could be an abstract design, a portrait or a realistic scene of some sort. Our imaginations were left to run wild! When it was time to begin, most people filled their paint pallet. There were tons of paint colors and brushes for us to choose from. Before I got my paint, I decided to make a visit to the bar for my second glass of wine. Just a fair warning, this is one of those times when “getting your money’s worth” might not be the best idea. I probably should have stuck with three glasses instead of four that night! I did accidentally bump into another painter while carrying a full glass of red wine back from the bar. To make matters worse, he was wearing a white shirt! I tried to redeem myself by wiping it off with a bunch of wet paper towels, but that didn’t turn out so well. Good thing he was getting his money’s worth too. He laughed about it and promised me he hated that shirt anyway. I just hope he wasn’t lying. The whole thing was pretty funny though. After I settled in with some more wine, I picked out my paint colors with absolutely no clue of what I was even going to paint! I just squeezed out a small drop of six or seven different colors that I liked and hoped a good idea would soon pop into my head. I sat down at the cute little round table and stared at my blank canvas for a few minutes. I couldn’t think of anything. The pressure! So finally I decided to paint what I always do when I color with my kids – a beach scene! Throughout the night, the hosts would let us know when it was almost time to pass our paintings. They used the number and timing of the songs on the record album they played. After about 15 minutes of painting our own canvas, which would eventually make it back around to us, it was time to find someone to pass it on to. That’s when we all mingled until we found another canvas to add to. We probably switched paintings five or six times the entire night. I was totally intimidated the first time we passed our paintings. I didn’t want to ruin someone’s art that I didn’t even know! To make it even harder, the first girl I switched with challenged me to not think of her painting as a sunset. But it looked just like a sunset! When I asked some others around me for advice, everyone was like, “turn it into a sunset!” It was time to get creative. The hosts really added a lot to the whole experience. They gave us helpful tips and they actually have real artistic experience themselves. They also cracked some jokes and were pretty entertaining. It’s not too often you meet painters who are also comedians. I ended up turning the “sunset” into a more abstract design, and I don’t think I did so bad. Plus, this was just supposed to be for fun. You don’t have to be a professional artist or even know a thing about painting either. They say, even if you can draw a stick person you’ll be just fine. Besides, it got much easier as the night moved on. And the wine helps get the creative juices flowing! I’m not sure if it was the wine or not, but one of the times we passed the canvas, I ended up with a painting that looked just like flowering pink lady part! I couldn’t get it out of my head the more and more I looked at it. I sort of just went with it – if you know what I mean. I was feeling a bit artistic anyway. Don’t worry, that one turned into a beautiful butterfly by the end. I kept feeling this anticipation of what my original painting was going to look like when I got it back. It was exciting to watch everyone’s reactions when they saw their original art! I was actually pretty impressed with some of them. When we finished, everyone had to choose whether they were going to keep their painting or donate it. I joked around with the hosts about whether my painting would end up in the “bad example” box if I decided to leave it! I was torn. I actually liked how my painting turned out, but I also knew the Green Room Lounge sells each canvas for $10 and donates the proceeds to charity. What an awesome idea! I took a picture of mine and decided to donate it. When it was all said and done, we helped tidy up and everyone had a chance to chat before it was time to head out. That’s when I got to know a very friendly painter in our group much better. She was a middle-aged woman who probably had a few glasses like me. I’m not really even sure how we got into it, but she told me all about her past lesbo experiences that she had a long time ago. At one point, she even palmed my bosoms! Woah. It just goes to show you how an event like this can really help open some people up. Pass the Paint, Pass the Wine is the perfect idea for a date night, too. There were couples of all ages on the Sunday I went. You could even grab dinner beforehand at one of the unique local De Pere restaurants nearby, like S.A.L.T, Caliente or Pasquales. But you definitely do not have to be on a date to join the fun. You could go with friends or even by yourself like I did! It would be an excellent bachelorette party idea, too. I really liked the laid back, comfortable atmosphere at the Green Room Lounge. The improvised collaborative painting was just my style. I also loved that we started with a blank canvas and could paint anything our little hearts desired. It was such an exciting two hour experience, and I would definitely suggest trying it! It’s a perfect way to change up your normal routine. Especially when you just need a little break from reality. The Green Room Lounge is definitely not the only place you can find an event like this. This whole idea has become a popular trend, and many bars, art studios, restaurants and other entertainment venues are starting to incorporate it into their event schedules. You’ll find similar events like this all over the state and on all different days of the week. Every one of them is a unique in its own way. Some are longer than two hours and some are 30 minutes. Some include beer, other cocktails and even appetizers. 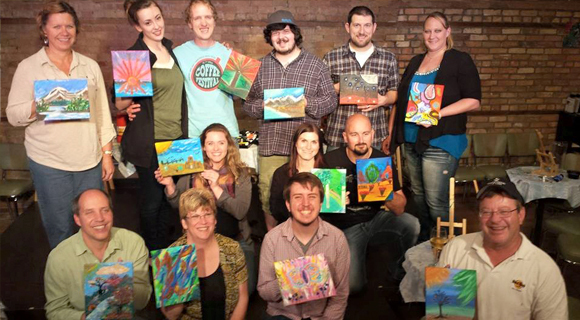 Many of these events feature a local professional artist and a specific picture or theme to paint.